Check out this beautiful, turn-key used MJM 40z boat for sale in Florida! : Atlantic Yacht & Ship, Inc. Check out this beautiful, turn-key used MJM 40z boat for sale in Florida! 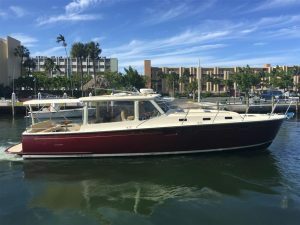 If you are in the market for a beautiful used MJM 40z yacht then don’t miss this used MJM 40z for sale in Florida! In the first place, Ramp 2 will host this Palm Beach MJM yacht boat for sale at the show this year. After all, this used MJM 40zis a great example of the consistent quality that MJM is able to deliver. After all, when you combine the beautiful Downeast Red hull you get a real head-turner! In fact, her hull design and composition result in a strong hull with a low center of gravity. This translates into greater stability and sea-worthiness which makes for an impressively comfortable ride! Moreover, with the effortless control that the twin 370 HP IPS500 pod drives you get an outstanding result in maneuverability. Furthermore, these state-of-the-art pod drives make for eco-smart performance as well. This is demonstrated by this boat being able to cruise at 32 knots with an impressive fuel economy. For more information on this sturdy used MJM 40z yacht boat for sale be sure to contact Brent DeSellier today! Check out this beautiful “turn-key” used 40′ MJM 40z boat for sale in Florida! Check out this beautiful pre-owned MJM 40z boat for sale in Florida! Don’t miss this beautiful used 40z MJM boat for sale in New England! Don’t miss this beautiful, turn-key used 40z MJM for sale!